The Tin Cup Pearl Necklace pairs the perfectly sized white pearls with a gorgeous 14K yellow gold 17 innecklace. The completely flexible necklace allows the pearls to lay freestyle along your neckline and to match the natural contours of your body. 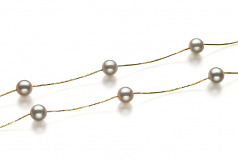 With the overall shape being out or rounds, the freestyle lay allows for a gentler look on the style and adds creativity to the pearls themselves. The follow up act is always the kinder gentler mirror like AAA luster. The Japanese Akoya pearls are known for their high quality pearls and their luster. These pearls are no different. They have a great overall gleam and it pairs well with the immediate introduction of the yellow gold chain immediately following each pearl. The Tin Cup Necklaces are a fun and flirty way to dress up any style of wardrobes.